1Secure the vehicle so that it won't roll; and roll the spare tire to the scene of the action. Never change a tire on an incline or hill; always seek a flat surface, even if it means driving on a flat tire. Use bricks, wooden wedges, or metal wheel chocks to block the wheels at the opposite end of the car from the end that is to be raised. 2Pry off the wheel cover. You can use a screwdriver to pry the wheel cover off. Just insert the point of the tool where the edge of the cover meets the wheel, and apply a little leverage. The cap should pop off. You may have to do this in a couple of places, as if you were prying the lid off a can of paint. You might know this as breaking the lug nuts. Whatever you call it, find the end of the wrench that fits the lug nuts on your vehicle, and fit it onto the first nut. Apply all your weight to the bar on the left. This starts turning the nut counterclockwise, which loosens it. 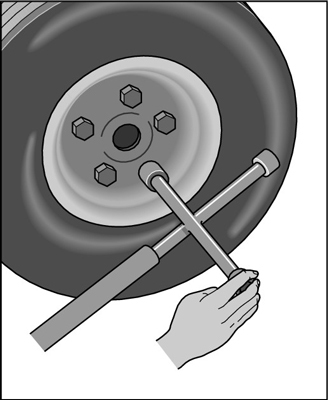 Don‘t remove the lug nuts completely; just get them loose enough to remove by hand after you jack up the vehicle. A hollow pipe and a cross-shaft wrench can loosen the tightest lug nuts. If you have alloy wheels that are held on by lug nuts with delicate finishes, the delicate aluminum or chrome-plated lug nuts need careful handling. They should never be loosened or replaced with power tools that can scratch the delicate finish. 4Jack up the vehicle about 6 inches off the ground. Place the jack securely under the edge of the car. Proper locations may vary among vehicle models, so consult the owner’s manual for the right places to put the jack. 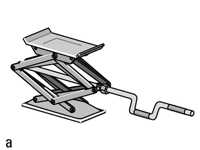 If you have a scissor jack (image a), insert the rod or wrench over the knob, and then crank. If you have a hydraulic jack (image b), place the handle into the appropriate location and pump up and down. Use nice, even strokes, taking the jack handle from its lowest point to its highest point on each stroke to cut down on the labor involved. Take the lug nuts completely off by hand and put them in a safe place — inside the wheel cover or hub cap works well. 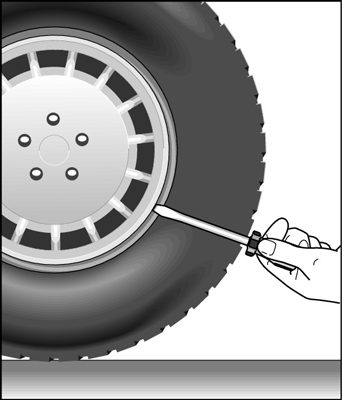 Grasp the flat tire with both hands and pull it straight toward you. As you pull the flat off, it should slide along the bolts until it clears the end of the bolts and you find yourself supporting its full weight. Roll the flat along the ground to the rear of the vehicle to get it out of the way. 6Lift the spare onto the lug bolts. Because tires are heavy, you may have a little trouble lifting the spare into place — especially if you’re not accustomed to lifting heavy things. 7Replace the lug nuts and tighten them by hand. 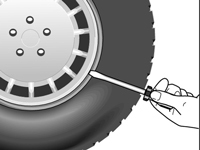 Give each lug nut a jolt with the wrench to get it firmly into place, but wait until the car is on the ground before you really try to tighten the lug nuts. 8Lower the vehicle and tighten the lugnuts. 9Replace the wheel cover or hubcap. If your car has wheel covers with a delicate finish, the owner’s manual should provide instructions for replacing it. 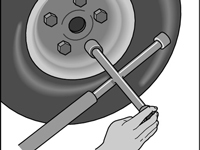 If your car has hubcaps, place the hubcap against the wheel and whack it into place with the heel of your hand. Cushion your hand with a soft rag first so that you won’t hurt it. And don’t hit the hubcap with a wrench or hammer — you’ll dent it.